Security guards at a South Loop Jewel-Osco store have come to the rescue of at least two separate robbery victims in recent weeks, according to Chicago Police Department reports. Around 4 p.m. on Nov. 24th, a 60-year-old man was using the grocery store’s restroom at 1340 South Canal when he was approached from behind, placed into a chokehold, and ordered to hand over his money, wallet and cellphone by a robbery offender, police said. The victim fought off his assailant and ran from the bathroom screaming for help. Police said a Jewel-Osco security agent chased the offender into the parking lot where the suspect pulled out a knife and charged at him, causing the guard to retreat. 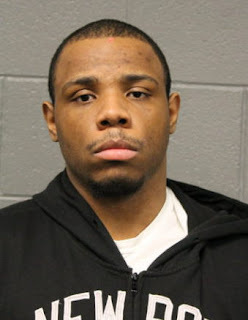 The guard gave police a description of the offender and cops quickly located the suspect at the Roosevelt CTA station, 30 East Roosevelt Road. Shavone Gunby, 24, was identified by the victim and the security guard. He has been charged with felony attempted robbery of a person over age 60, aggravated battery of a person over age 60, and aggravated assault with a deadly weapon. Police said in Gunby’s arrest report that he admitted to putting the victim in a chokehold. Judge Michael Clancy ordered Gunby held in lieu of $200,000 bail. Less than one week earlier, a guard at the same Jewel came to the rescue of a 29-year-old man who ran into the store’s parking lot while being chased by three men who were allegedly trying to rob him, according to police records. The victim was just outside the Jewel parking lot on Clinton Street around 3 p.m. on Nov. 18th when three men approached him. One of the men, now identified as 32-year-old Wonne Fisher, allegedly told the victim, “We can do this the easy way or the hard way. You already know what we want. Give up your iPhone.” A second offender, identified as 21-year-old Albert Harshaw then tried to grab the victim, police said. The victim swung at the three men, then ran into the Jewel parking lot where he flagged down a security guard who intervened. The three offenders then ran away. Police drove the victim around the area and took Fisher, Harshaw, and 34-year-old Deandre Crawford into custody after they were identified as the robbers by the victim, a police incident report said. Each of the three men has been charged with attempted robbery. Judge John Lyke ordered all three suspects to be held without bail.